This free ebook is a collection of stories about men falling love, struggling with their own or other’s views of their orientation, and having some damn interesting adventures. It is a product of the Goodreads M/M Romance Group Scavenger Hunt challenge and features original stories from some excellent authors. The Scavenger Hunt challenge is an event where readers find books that fit a criterion (like having a green cover or a title starting with “D”) and then find specific items within the pages of these books to add up to as many points as possible (for example, “twin bed” = +2 points). This challenge was a helluva lotta, fun and so we thought we share by creating the ultimate 2013 Goodreads Scavenger Hunt book.This book was lovingly put together as a baby gift for Katie, our tireless leader, who recently had her first baby and is probably just now realizing what “busy mom” really means. Congratulations Katie!We’ve listed the items you need to find in the front of the book. 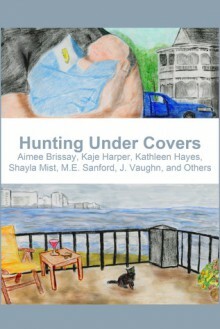 Happy Hunting (Under Covers).Publisher’s Note: This book is intended for adult audiences. It contains sexually explicit scenes between two or more men, violence, and language which may be considered offensive by some readers.